Biting into a warm and buttery corn on the cob is always a great way to start a summer meal on the patio. With the summer growing season, the BEST corn has been showing up at my local stores and farmers markets the past few weeks! Naturally, that means I have been indulging in one of my favorites! White Corn! I love basically all corn. 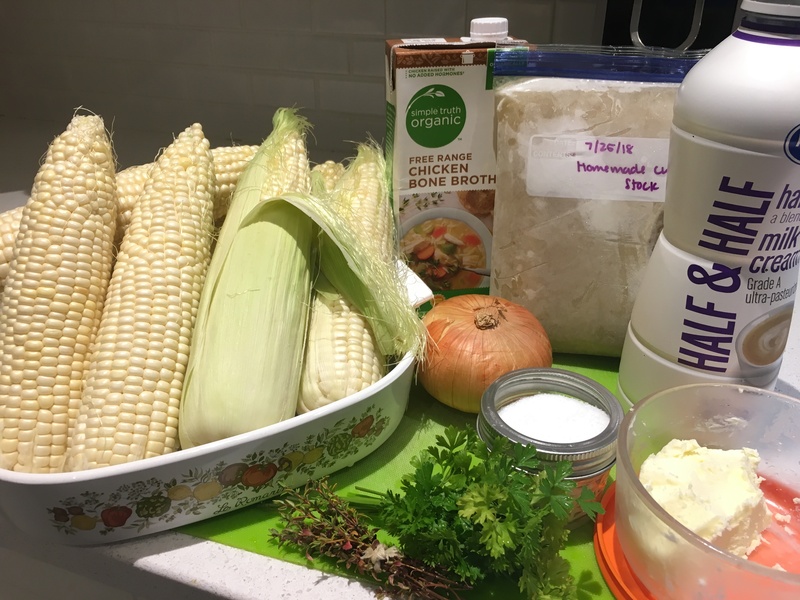 Yellow corn, white corn, bi-colored corn, popcorn, baby corn… but there is something extra savory about white corn that just makes it stand out. And since I can usually only find it a few weeks each year, I take advantage of those few weeks! This recipe is going to make a super great corn soup that is incredibly easy to freeze and save! I love pulling a bag of this out on a winter day and remembering the warmer summer memories. It is a bit time consuming, but this soup is soup-er easy (pun intended) and I promise it is well worth the time! Recipe Background: I have basically spent my entire marriage thus far trying to replicate the best corn soup I have ever had. My husband and I honeymooned at Secrets Silversands Riviera Cancun and one of the best foods they served (and best things I have ever been served) was what I can only describe as a rich bowl of liquid corn bread. The chefs were nice enough to give us a recipe, but unfortunately we lost it somehow somewhere on our way home 🙁 I am sure one day I will figure out what that missing ingredient is! Until that day comes, we can all enjoy this version, to which I can best describe the flavor as buttered corn on the cob! Once you have gathered all of your ingredients, you want to start thawing your chicken stock on medium-low heat (if using homemade broth that has been frozen). You will want to use the smaller of the two stock pots needed for this recipe. Also, here is a great homemade chicken stock recipe if you need one! I used half homemade and half store bought. Next you want to start by cleaning the corn. Shuck the husk away, remove as much ‘hair’ as you can (some leftover isn’t anything to worry about), and give it a quick rinse with water. The husk is easy to remove, and in my opinion, not worth paying double (or more) to have the store clerks do it for you! This next part is the most time consuming part: stripping the kernels from the ear of corn. You can use a knife and carefully cut all the kernels, but I personally don’t like that method as I have cut myself one times too many doing it that way. I prefer using my corn stripper (and the safety of my fingers is well worth having this unitasker around) because as you start slicing into the kernels, the cob becomes very slippery and hard to hold! Pro tip: strip the kernels directly into your stock pot to save washing an extra dish. Once most of the corn is off the cob, I like to take a knife and carefully get the last bits off the cob. My corn stripper does not adjust for the different widths of a typical ear of corn, so I try to get the corn from the narrower end of the cob. I can get up to an additional 1/4 cup of corn from each cob doing this. Again–do this very carefully! Once I am satisfied, I break the ears into two. Mind you, this step is optional if your cobs will all fit whole into your stock pot. Now we get to start building the corny flavor! The cobs, while 97% stripped of their yummy corn, still have a lot of flavor to offer! I like to add the cobs into the chicken stock and simmer them together for at least the next 30 minutes. This is the same concept to boiling leftover chicken bones to turn water into stock. I want as much of the corn flavor as possible to infuse itself into this dish. Our onion is pretty simple. It needs a quick rough chop and gets added to the corn. It will have plenty of time to cook down and will ultimately be blended smooth, so it does not need to be cut super precisely for presentation. Your corn and onions are already both in the larger of your two stock pots now. Go ahead and add your thyme and parsley bundles, salt, and butter. I couldn’t possibly call this a buttered corn bisque if there was no butter! I prefer to bundle the thyme and parsley so that they are easy to remove from the soup before we blend it all together. The corn mixture can be heated on a low heat. We want to start cooking the corn, softening the onion, and infusing the flavorful herbs; this should be done slowly with frequent stirring to avoid any browning (or burning). Expect this to be at least 20 minutes, or until the corn cobs have infused all of their corny tastes into the chicken stock. Turn the heat off of the chicken stock/corn cob combo. Once the combo has stopped boiling, remove the corn cobs from the combo and carefully pour all of the corn flavored stock into the larger stock pot. Bring to a simmer for at least 15 minutes. We want to ensure the corn and onions are a soft as can be! Remove the stock pot from the heat and allow to cool for at least five minutes. Fish out the limp herbs, they have completed their job. Grab your handy dandy immersion blender and start blending! The mixture is still very hot, but no longer boiling. You do still need to be careful not to splash yourself by un-immersing the immersion blender while it is running. Keep blending until smooth. I like my corn soup as smooooooth as can be. For this reason, I use my fine mesh strainer to get out the corn skins. It isn’t a flavor need, but a texture need that I do this. If you have either, a food mill or chinois are also great for this step! The progression of pictures above is pouring the blended corn soup into the strainer, using a silicone spatula to stir the bottom of the strainer, then the leftover bits once the maximum amount of super smooth soup has been strained. The spatula basically transforms the mix by scraping along the bottom of the strainer and moving the solid bits out of the way to allow for the liquidy soup to pass thru. Lastly, to amplify the creaminess of the bisque I add some Half & Half. Just 1/2 cup will do! One last good stir and your Buttered Corn Bisque is ready to enjoy! Again, this recipe freezes wonderfully! Add bundled thyme, bundled parsley, salt, and butter. Cook on low heat and stir frequently to avoid burning.Estimated time: 20 minutes minimum until cooked thru and soft. Turn off heat and remove corn cobs from chicken stock. Add ‘corny’ flavored chicken stock into larger stock pot. Allow to simmer together for at least 15 minutes. Enjoy as is, or package into freezer baggies and enjoy another day! I have found that the best buttery flavor comes from butter that I make myself: use blender or immersion blender to make whipping cream into fresh butter. It is butter when the milk liquids separate completely from the milk fats.